Different type valves for ships use : Valves are provided in a piping system to regulate or stop the liquid flow. Various types exist in a machinery space with their associated particular function or advantages. 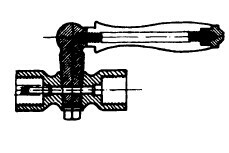 A globe valve has a somewhat spherical body enclosing the valve seat and valve disc . 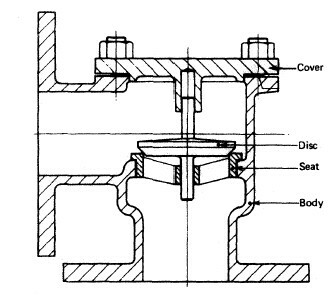 Flanges are provided at either side for connecting to adjacent pipework, and internal passages guide the liquid flow through the valve seat. Liquid flow is always arranged to come from below the valve seat so that the upper chamber is not pressurised when the valve is closed. 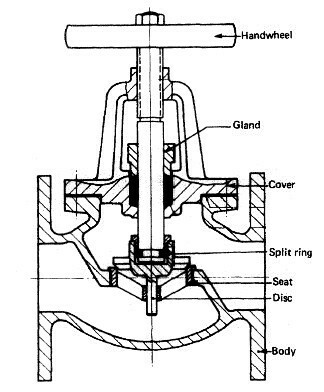 A screw lift valve arrangement is shown where the spindle is joined to the valve disc. A gland with appropriate packing surrounds the spindle where it leaves the valve bonnet. The upper part of the spindle is threaded and passes through a similarly threaded bridge piece. A circular handwheel is used to turn the spindle and raise or lower the valve disc. The valve disc and seat are a perfect match and may be flat or, more commonly, mitred. The material for both is often provided with a very hard stellite coating. Globe valves also exist in a right-angled form where the inlet and exit flanges are at 90° to each other. Non-return or check valves are arranged in various pipelines to prevent reverse flow. 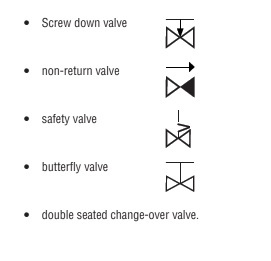 Where the valve disc is not attached to the spindle it is known as screw-down non-return (SDNR). The valve disc in such a valve must have some form of guide or wings to ensure it can reseat correctly when screwed closed. Non-return valves are sometimes arranged without spindles, in which case they are liquid operated and can not be manually closed . A free lifting valve may be used or a hinged flap. A gate valve should be fully open or closed; it is not suitable for flow control. When open it provides a clear full-bore internal passage for the liquid since the valve or gate is raised clear . The spindle is threaded over its lower portion and when turned causes the gate to raise or lower. The gate may be parallel or wedge-shaped in section fitting against a matching seat. Larger valves have replaceable seat rings and gate facings. Excess pressure is avoided in pipe systems by the use of relief valves. 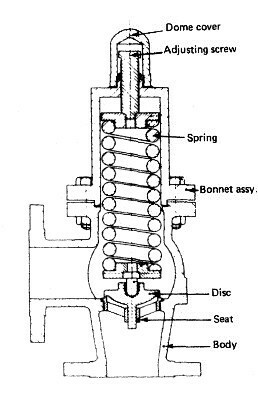 The valve disc is held closed by a spring arrangement on the stem . The spring compression can be adjusted to enable the valve to open at the appropriate pressure. Boiler safety valves are a special case of relief valve . Oil tank suction valves are arranged for rapid closing from a remote point by the use of quick-closing valves. The collapsing of the 'bridge' results in the valve closing quickly under the combined effects of gravity and an internal spring. A manually operated wire or a hydraulic cylinder can be used to collapse the bridge. 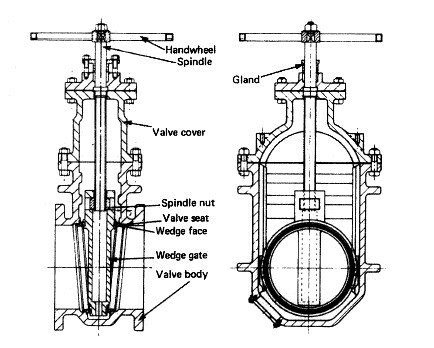 Butterfly valve – A rotary stem valve with a centrally-hinged disc of the same dimension as the pipeline. The valve opens into the pipeline and therefore takes up little space, permits large flow rates and gives minimum pressure drop. Valve chests are a series of valves all built into a single block or manifold. Various arrangements of suction and discharge connections are possible with this assembly. All ships side valves are to be maintained in good working order. Testing and lubrication of the valves is to also to be in accordance with the PMS system requirements. This is to include a weekly test of all shipside valves which are to be systematically closed and re-opened under the supervision of the Chief Engineer. All valves must be properly identified and labelled in order to minimise the risk of incorrect operation and relevant staff briefed in their correct function, where appropriate.